Samsung’s J series is probably company’s most popular mid-range smartphone series and every year; the company launches new J-series devices. This year, Samsung has already launched the Galaxy J7 2017, J5 2017, J7 Pro, J7 Nx and the Galaxy J7 Max. 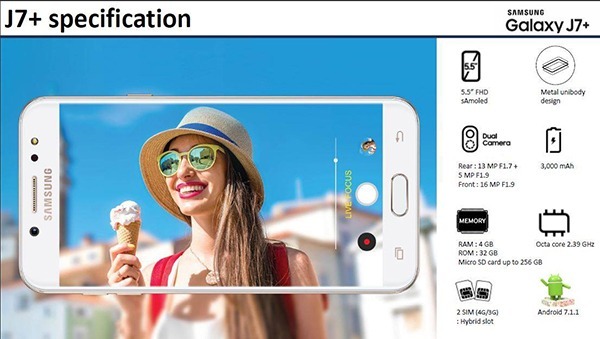 But hey, Samsung isn’t yet going to settle as there is still one more J series phone coming soon and that’s the Samsung Galaxy J7+ with dual cameras. 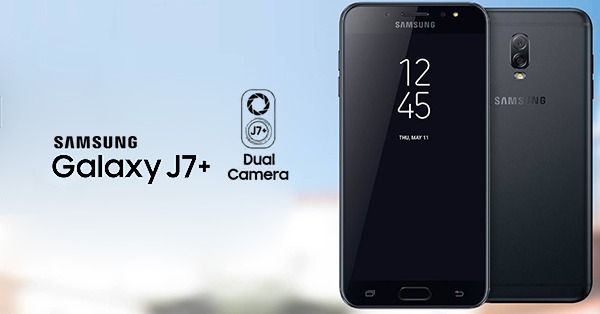 So basically, the J7+ is the second Samsung smartphone to come with a dual rear camera setup. A couple of days back, the first image of the phone leaked revealing one of the key features of the phone, i.e., the dual camera setup with Live Focus feature that is already there on the Note 8. Today, another image shows the phone from both the front as well as the rear which gives us the best look at the phone so far. From the front, there is no difference as it looks the same as any other J series phone with a front-facing LED flash, a 5.5-inch display and a front fingerprint scanner embedded under the physical home button. But as mentioned above, it’s the rear that makes the difference. Now, there is a dual camera setup on the back that is going to provide the same Live Focus feature as on the Note 8. In case you don’t know, it is the feature similar to the iPhone 7 Plus’ Portrait mode. Well, what are your opinions about these specifications? Do let us know via the comments section.